"I want my freedom!" "But are you willing to pay the price your freedom will cost?" Pixar has a pretty impeccable track record. Their films have a level of anticipation surrounding them that can be unfair to the films themselves, but the most impressive thing about the studio is how (up until last year's Cars 2) they are always able to squash those that doubt their abilities. Their latest effort is Brave, and it falls firmly in the middle of their repertoire. It's not their best film, but it's hardly their worst. If it is one thing, though, it is most assuredly their first "Disney" film. Brave is the story of a young princess, Merida (Kelly MacDonald), the eldest child of King Fergus (the always delightful Billy Connolly) & Queen Elinor (Emma Thompson). Because she is, for a time, the only child of a great warrior, her father raises her to be good with a sword and, particularly, a bow and arrow. 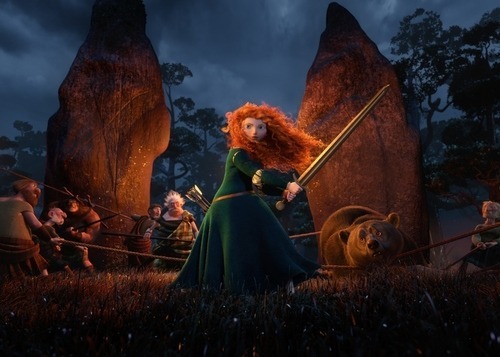 The film opens with a terrifying sequence where a bear attacks the young Merida, taking her father's leg in the process, and it set the tone for what promised to be a rollicking adventure. Retrospectively, it feels a bit like a bait-and-switch as the film settles in and becomes a bit of a chamber piece, at least as much as an animated film set in the Scottish Highlands can be. Merida is a defiant teenager, and as she comes of age, she finds out that she is to be betrothed to one of three suitors from the other clans in their kingdom. The other lords, Dingwall (Robbie Coltrane), MacIntosh (Craig Ferguson) and the delightfully named MacGuffin (Kevin McKidd) travel to Fergus' castle with their clans & their eldest sons to compete for Merida's hand. Merida wants much more than this provincial life, however. She doesn't like the idea of her parents deciding her destiny for her, so she runs off to seek her own way. Now, Pixar has marketed the film in an incredibly savvy way, in as much as they have not revealed anything about the plot beyond this point in the story in any of their advertising. It would be a cheat for me to go any further in my plot discussion, as this is such a rare occurrence in modern cinema, that I must bow to their wishes and not divulge any more of the plot. What I can tell you, however, is that for as good as the film is, and it is very good, it is nothing you haven't seen before, and that is its biggest weakness. My daughters frequently ask me who my favorite Disney princess is, and I always tell them that it's Belle. Belle is focused, determined and literate, not something you can say about many of the others. She's got faults of her own (not the least of which is her daddy complex), but I like Belle because she doesn't seek validation from others. Merida is a lot like Belle. Thankfully, Pixar was smart enough not to shoehorn in an unnecessary courtship, but Merida's stubbornness gets the best of her, and leads her to make some poor choices that she spends the rest of the film trying to reconcile. There is absolute growth on her part as a person and a character (and from her mother as well) and that's a breath of fresh air in the animated princess realm. Ultimately though, Brave is sadly nothing more than a conventional Disney princess film dressed up in the clothes of a much smarter and savvier film than it truly is. The princess films always put absurd time restrictions on their characters to overcome seemingly insurmountable obstacles, and that's the biggest mistake that first-time Pixar directors Mark Andrews & Brenda Chapman make. The ticking clock is hardly a new plot device, and when used well (the Beast's rose for example) it can work marvelously. However, the time restraints placed on the characters here make the turnaround that everyone must do unbelievable. No child (or adult even) can come to realize that what their parents have been trying to get them to understand their entire lives in an instant. It just can't happen, and I know it's a fairy tale, but the 180 that Merida does just prior to the film's climax is forced and ultimately works against the film. I won't say any more lest I risk spoiling the plot, but I was more upset about this while watching the film, and slightly less so in retrospect. I guess I wanted a strong heroin who would grow and change over time, not be forced to realize the error of her ways in 48 hours because there's dire consequences if she doesn't. The voice acting is wonderful across the board. The film looks gorgeous, but I would highly recommend NOT seeing it in 3D. The 3D was superfluous at best and downright unnecessary at worst. There is very little to provide depth of field. More than half of the film is indoors, and even the scenes outdoors are confined to the woods, and there was no real reason for it to be in 3D. I think it would have looked better had I not seen it in 3D. Overall I think that if the film is a disappointment at all, it's because Pixar has proven that they are fallible. Cars 2 was such a huge misstep that they couldn't help but make a much better film by comparison, but as I said before, Brave is just a very good Disney princess film. One of the trailers before the film was for Wreck-It Ralph which seems more like a Pixar movie than even Pixar is making these days, and I guess that's what's disappointing. Disney is beating them at their own game. If there's any recommendation I have, it's to lower your expectations. Sky high expectations can only hurt a movie like this, and end up being unfair. This is a must-see for young girls and their mothers, and I'm sure that boys will find something to glean from it all. It features an admirable and strong role model for young girls, and the relationship between Merida and her mother will be a joy for mothers and daughters of all ages. As a side note, the short before the film "La Luna" was amazing. It's one of my favorite Pixar shorts, and looked better in 3D than Brave did. Make sure you get there in time to see this, it's brilliant and beautiful.